It's been a fraught afternoon and evening for crafting: New Zealand vs Australia in the World Cup at Eden Park. In this cricket-mad household, it's a wonder anything got made at all! But a tense and unbelievably exciting one-wicket win for New Zealand, with plenty of overs to spare, meant I could go to my room and turn my full attention to the sketch at Freshly Made Sketches. My performance had been so cricket-affected that after the final ball (and suitable time for joyful victory rituals) I pulled apart the card I'd been doing on-and-off during the innings and started again! 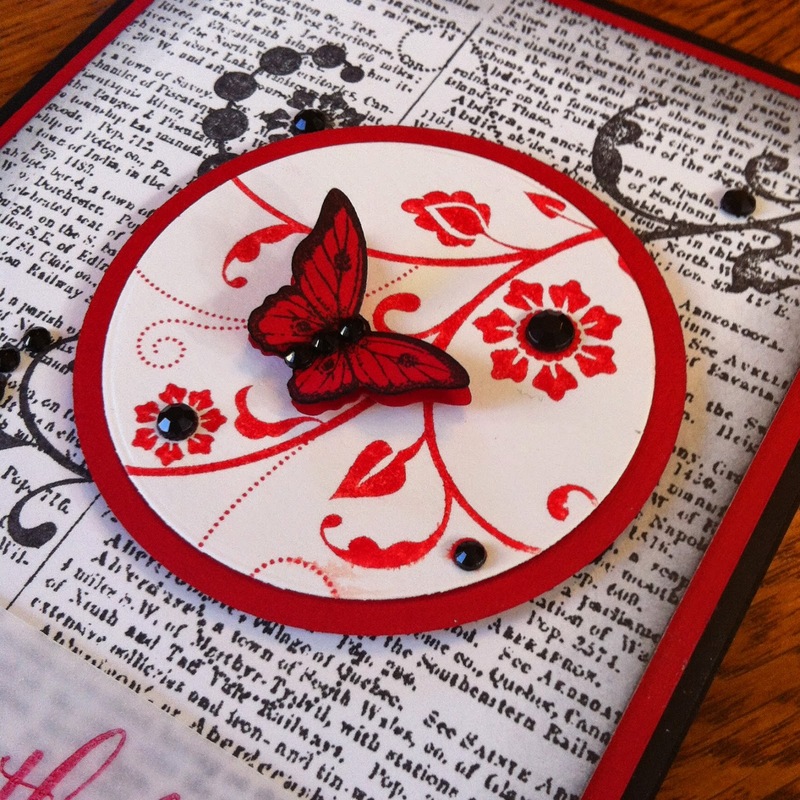 I tried a different approach to the background stamp with this card. I wanted a slight distressed element in the card, so I used attached the white panel to the red base and then stamped using my fingers to press down on the paper. I did not press evenly around the edges and got this very slight inkiness on the red, which was just right. Update: Delighted to be picked as a Perfect Princess at Freshly Made Sketches! 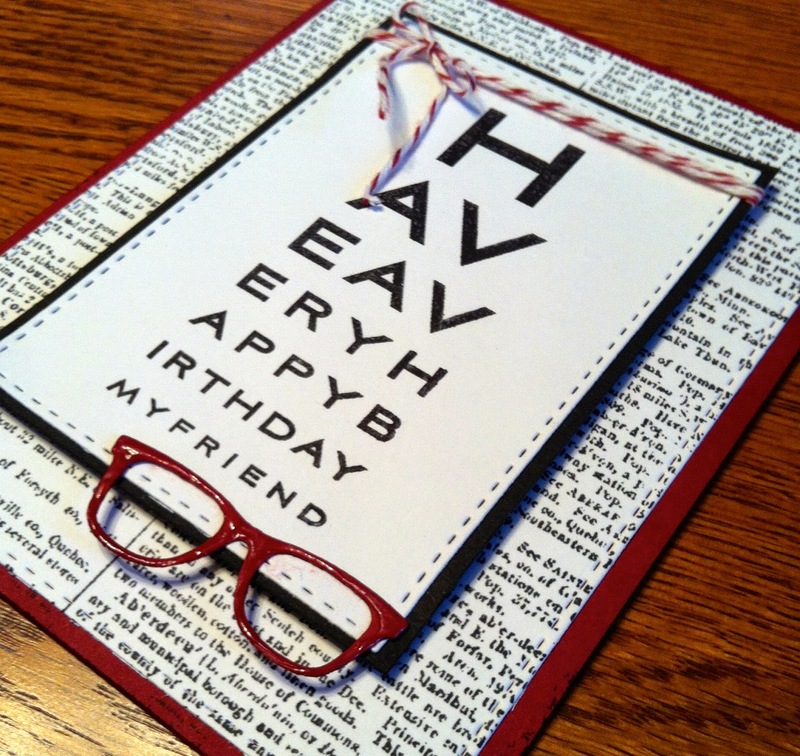 Other: Stitched rectangle dies, MFT Geek is Chic Glasses die, Cherry Cobbler baker's twine, dimensional, glossy accents. Crushed Curry is a colour that languishes in my craft boxes, often ignored and unused. So, I was quite surprised to find myself reaching for it today for my vision of a summery card that could be multi-purpose: missing you, get well or maybe even sympathy. This was in response to yet another delightfully enticing sketch at Paper Craft Crew. Such a good discovery! 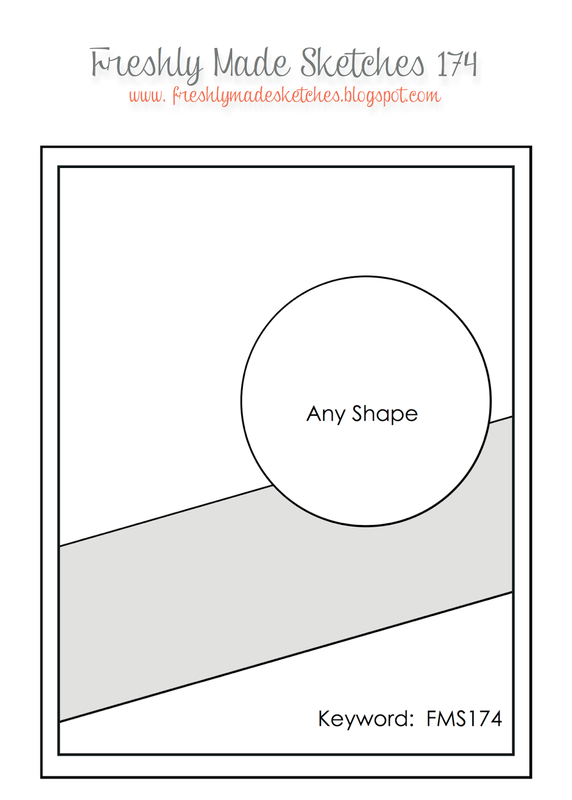 The layers of the 'you' are slightly offset to create a shadow effect. The edges of cut panels have been coloured black to add definition to the shapes. I'm very happy with the flower, made of four layers of flowers from the pansy punch that were cut in Crushed Curry and sponged with Calypso Coral. The top two layers, I snipped a little between petals to allow them to curl up more to create extra depth. Stamps: Crazy For You, Papillon Potpourri, Gorgeous Grunge, the rain splatter from French Foliage. Although I love my job, today, as summer draws to a close, I wished I was at the beach. 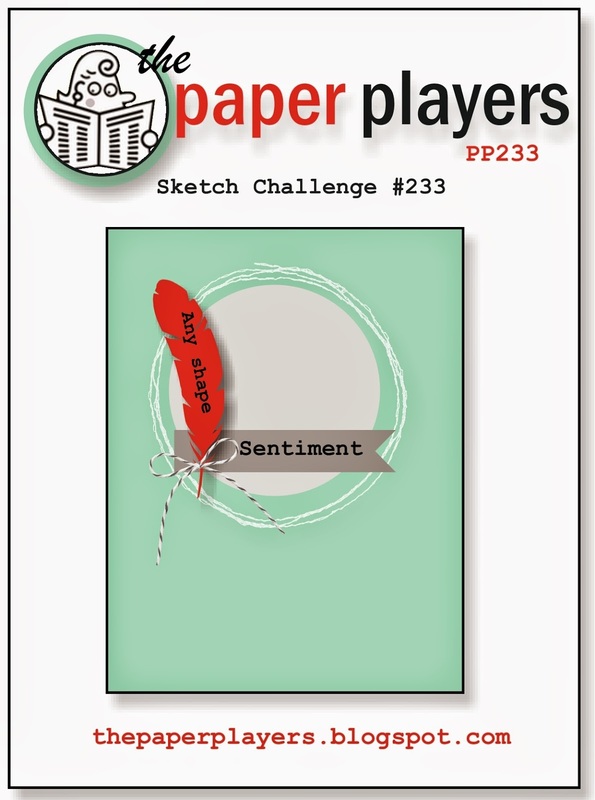 Before work, I'd checked Feedly and seen the new sketch at Paper Players. So while daydreaming of the beach, the idea for a card to match the sketch came along. I've said before that By The Seashore was the first ever SU set I got. In fact, it was the first stamp set I ever got fullstop and I've had used it so much, it was a good investment. Here I've stamped it onto Crumb Cake with Early Espresso and Island Indigo and then sponged the edges after fussy-cutting them out. The Espresso starfish I stamped off first so it would be a different shade. I'm very pleased with the Hardwood panel. It's Pool Party on Pool Party and I finger stamped it so that it would be a little bit patchy and would look more beach-weathered. I also sponged the edge. By far the fiddliest bit was getting the baker's twine into a circle without getting glue over everything. Slow and steady won that race! I really enjoyed interpreting this sketch and it's turned out to be a good masculine card, although fine for women as well. But I still wish I was at the beach! Update: Delighted that this card was picked as A Cut Above at Paper Players. Ink: Pool Party, Island Indigo, Early Espresso, Crumb Cake, Soft Suede, Black Stazon. Other: Circle die, Island Indigo baker's twine, Early Espresso marker to augment the bird stamp, dimensionals, sponges. As I mentioned in my previous post, I've promised to make some wedding cards for a friend but I've been procrastinating. 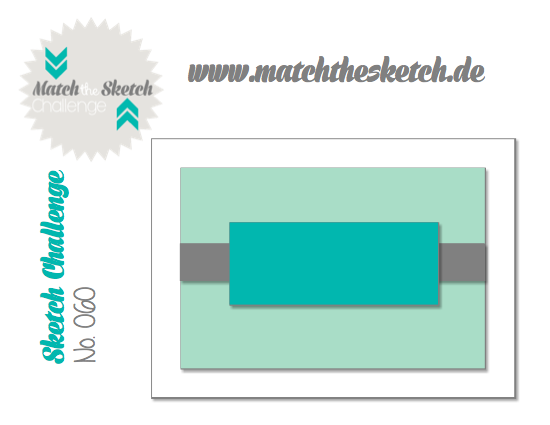 The sketch at As You See It gave me one idea and the sketch here at Match the Sketch gave me another. Serendipity! Originally, I'd intended to make this card in Blushing Bride, only to discover that my last piece was about 1cm too short to make a good card base. So instead, it is done in Pool Party with touches of Coastal Cabana but I like it like this too. The lace panel, like the white hearts, has had the edges sponged with Pool Party. 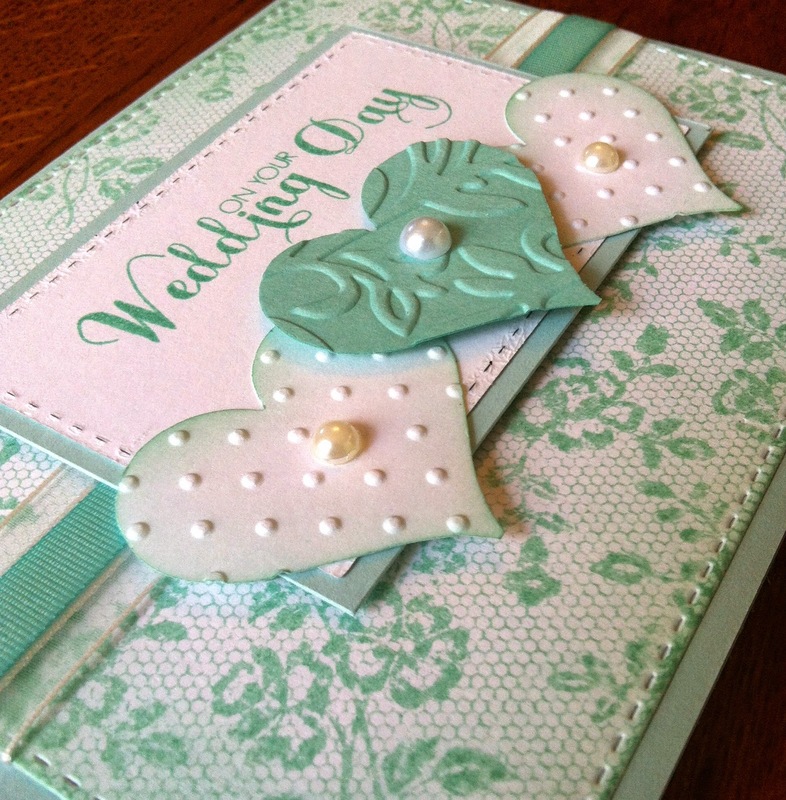 Other: Stitched rectangle dies, Sweet Heart punch, Whisper White organza ribbon, Coastal Cabana ribbon, Provocraft Swiss Dots and Victoria embossing folders, Sponges, Pearls, dimensionals. A friend recently asked me if I could make her a wedding card for a second-time-around wedding. I said I'd make her some and she could pick - but I haven't really done wedding cards before. Procrastination is not your friend. So it was a great thing when the sketch from As You See It stirred an idea that led to some action on the wedding card front. 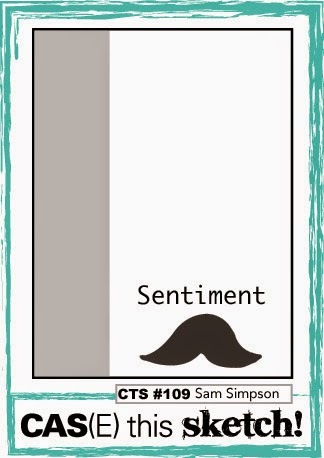 I'm also going to enter this card in the Simon Says Wednesday Challenge, where this week it is Simon Says Add A Little Texture. I've never entered anything here before but it was the Simon Says Stamp Store that taught me that on-line, international shopping is easy and fun and that stuff arrives FAST! 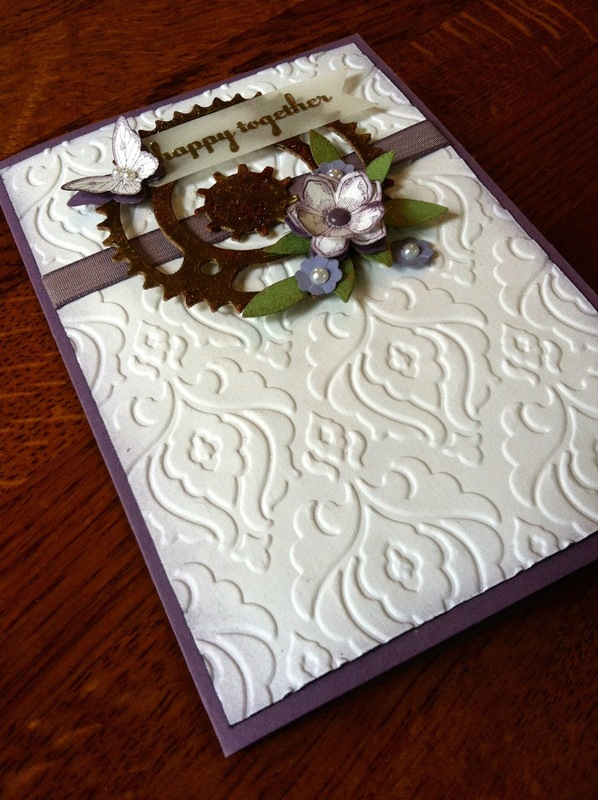 Card: Whisper White, Wisteria Wonder plain and DSP. Embossing folders: Provocraft Textile, Victoria and Swiss Dots and SU Beautifully Baroque. Other: SU Something Borrowed embellishment, SU Whisper White ribbon, Elegant Eggplant marker to colour each cut edge, Heart punch, rhinestone, dimensionals. 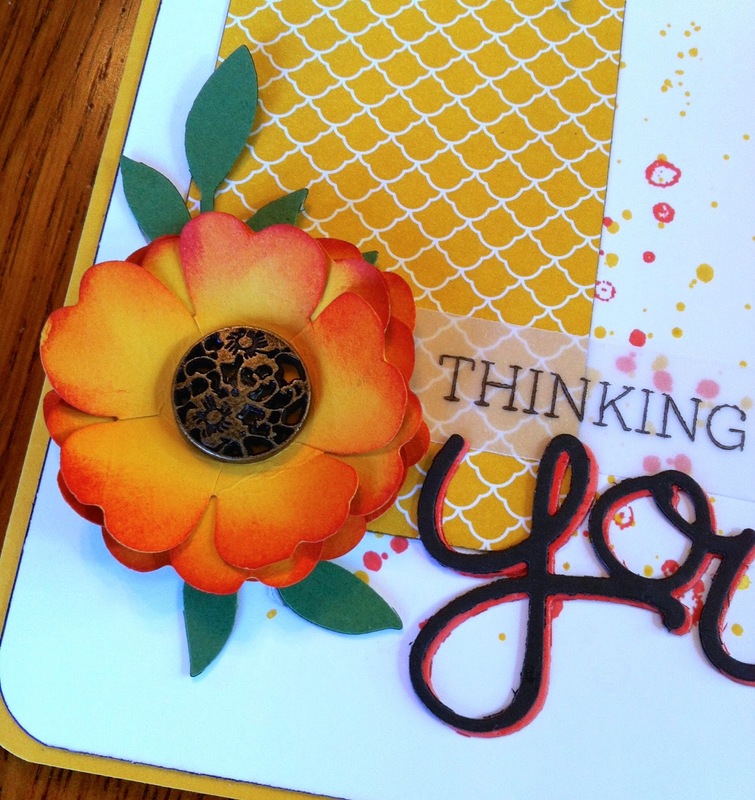 Another delightful sketch this week and as a personal challenge I decided to only use Stampin' Up stuff. 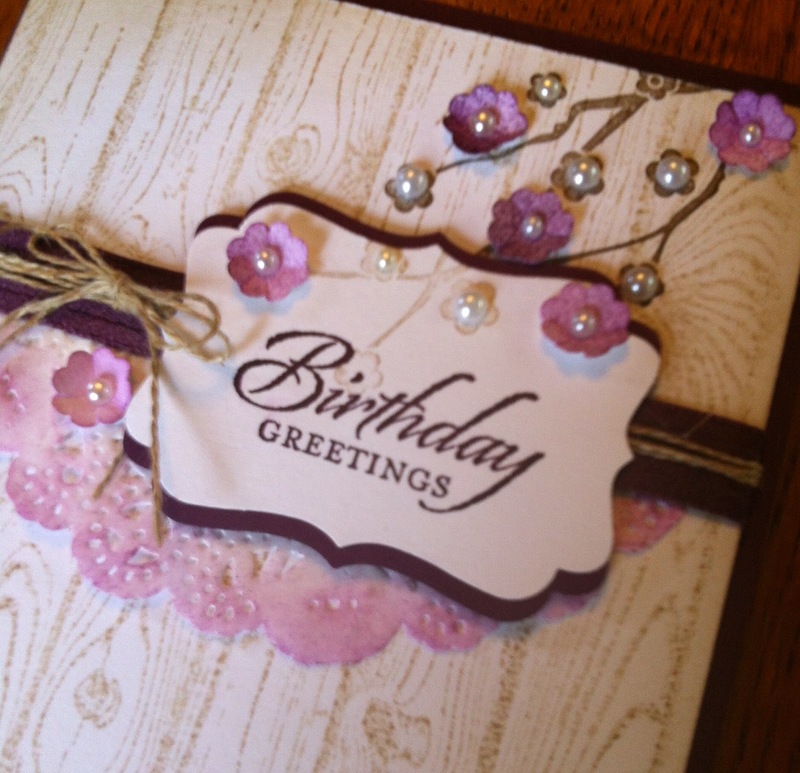 The card base is Blackberry Bliss and I used Crumb Cake with it - it's a favourite combination of mine. 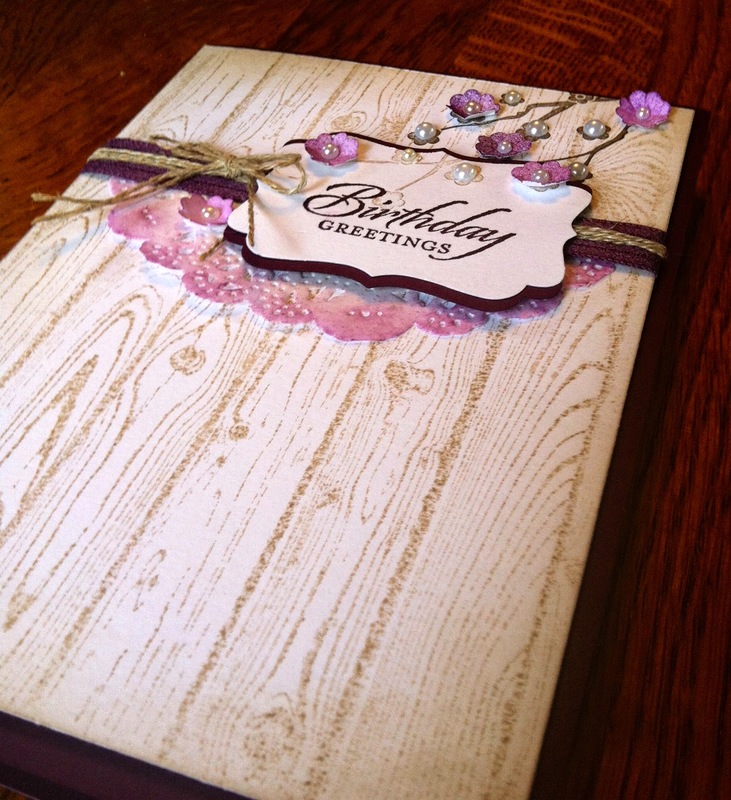 The Hardwood background stamp is in Crumb Cake on Whisper White and the edges lightly sponged in the same ink. I cut the bottom third from the small SU doily and lightly sponged the edges in Blackberry Bliss. The small blossoms, cut using an itty-bitty punch, were cut in white and sponged various shades of Blackberry Bliss. The cherry blossom branch is from Eastern Blooms, a set I got second-hand last year. On the hardwood panel, it is stamped in Early Espresso and, on the label, in Crumb Cake and then overlaid so the stamp is complete. Some of the stamped blossoms have been replaced by the cut blossoms or pearls. I do love the linen twine - I'm already into my second packet and will have to stockpile if it ever retires! The SU-only personal challenge hit a bit of a problem when it turned out my SU pearls had run out and I had to use some others I had. Update: Delighted to be picked as a Featured Artisan for this card. Other: Small doily, Blackberry Bliss ribbon, linen twine, Itty Bitty Punch, Pearls, Decorative Labe punch, sponge, Dimensionals. 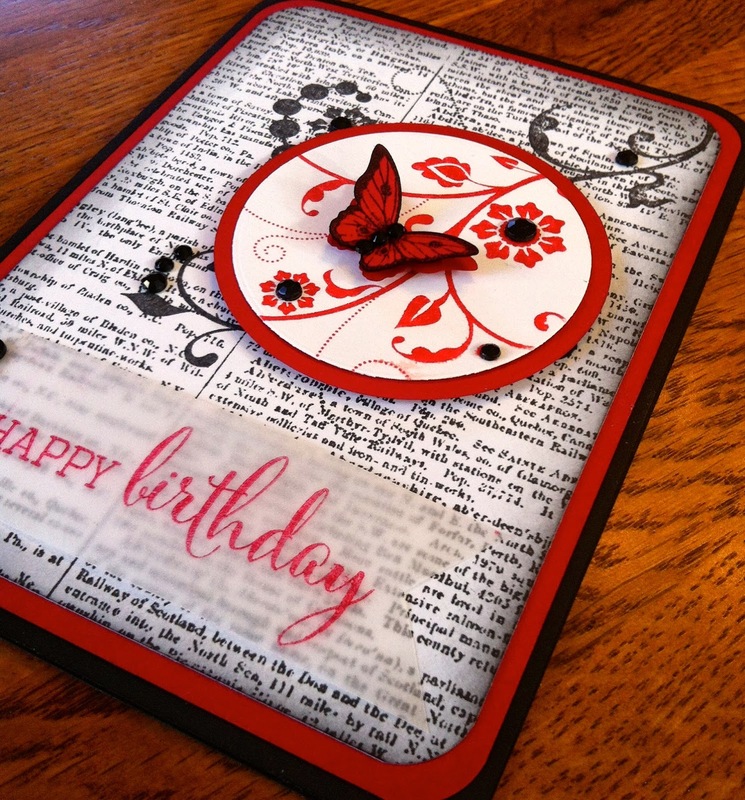 Last weekend, I made a card using my Sprightly Sprockets dies. They were still on my desk and as they are such fun to use, they ended up contributing to this card for Pals Paper Arts and Just Add Ink too. 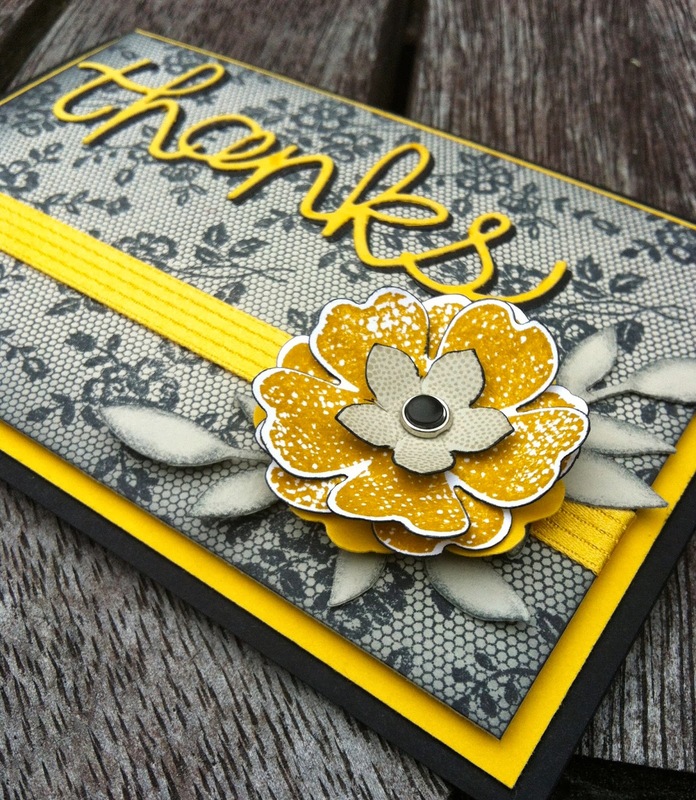 while Just Add Ink's theme was to "Just Add Thanks." 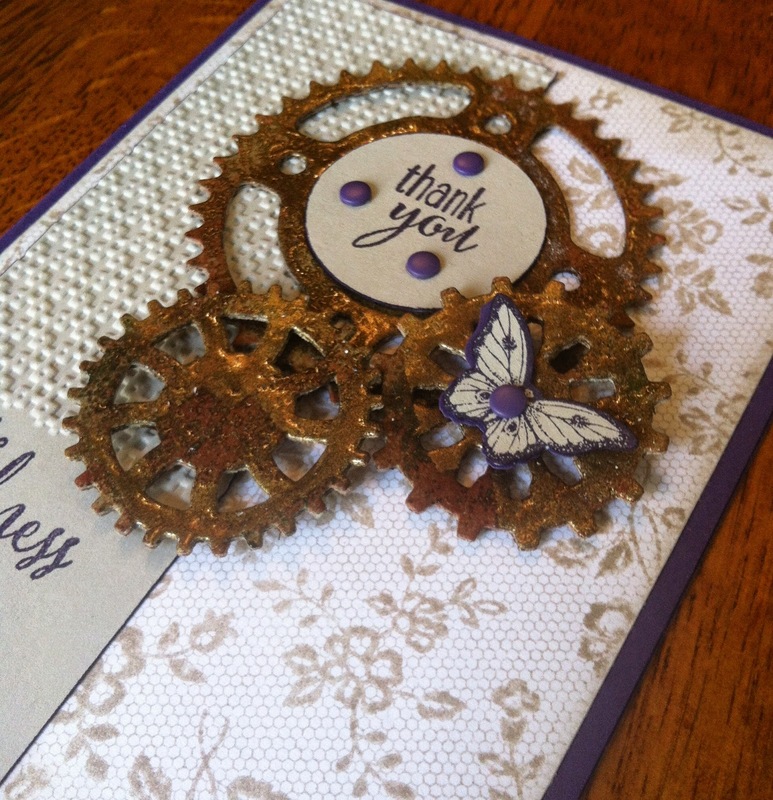 I've had fun experimenting with faux metal, ever since I saw a video by Allison Okamitsu on rusted metal embellishments and had another play around with these cogs today. They started life this morning as a piece of corrugated cardboard from the recycling box. 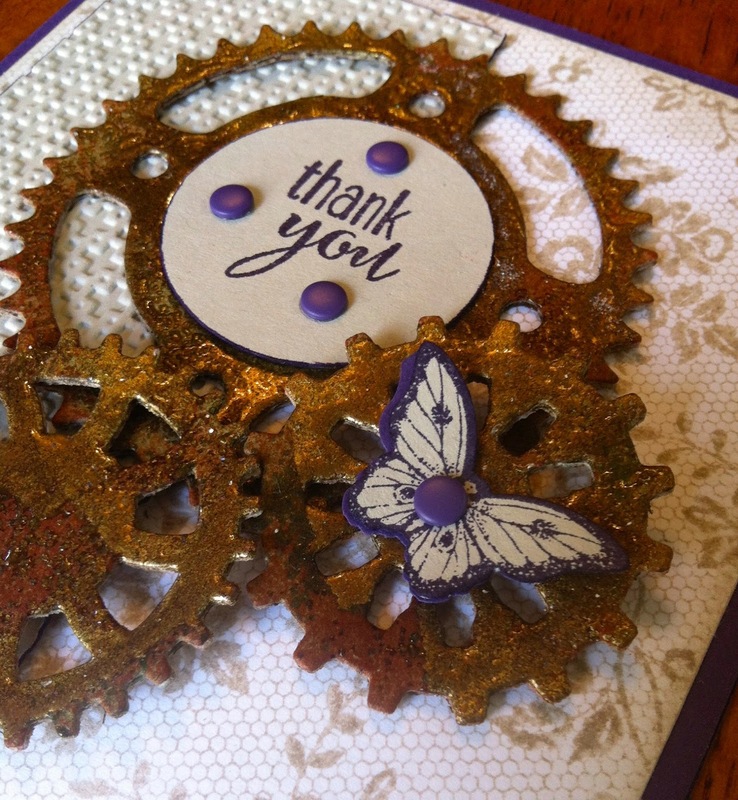 I ummed and ahhed over using the three candy dots in the centre circle but in the end I put them on because they drew attention to the thank you, they linked the Elegant Eggplant together more and their shape replicated the circle holes in the cog, so added to the overall unity of the card. And I'm still having a little love affair with the I Love Lace stamp. Update: Delighted to have this card in the Top 3 picks at Pals Paper Arts. Inks: Elegant Eggplant, Sahara Sand in the card. 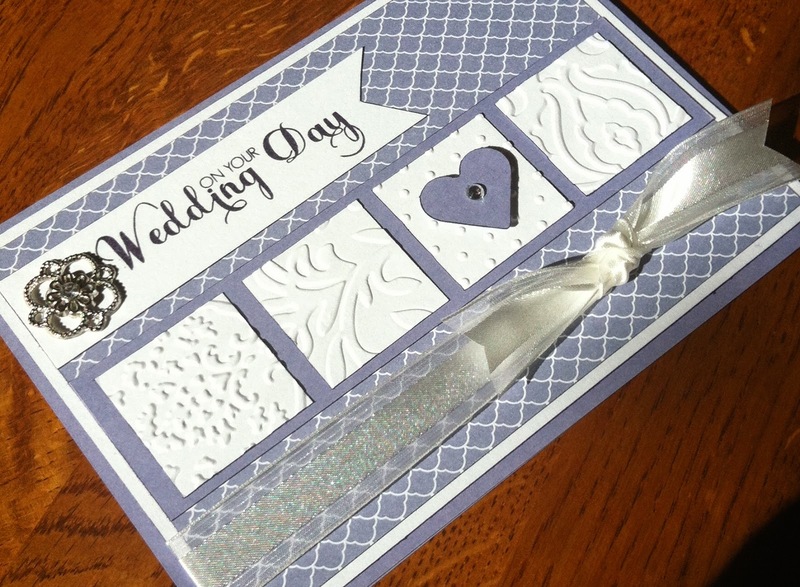 Other: Butterfly punch, Elegant Eggplant candy dots, Square Lattice embossing folder, sponge for the light inking around the lace panel, dimensionals to lift the centre circle and small cogs, Elegant Eggplant marker to colour all cut edges. Corrugated cardboard, Spellbinders Sprightly Sprockets dies, gold ink, Cajun Craze and Pool Party, Clear and gold embossing powder. I really loved the sketch at Freshly Made Sketches this week. It was another great one. The card ended up being a collection of favourites: a favourite colour combination, an old favourite stamp set (Kinda Eclectic) and new favourites (I Love Lace and the sentiment from Clearly Besotted). The lace panel is Crumb Cake on Whisper White, which was then cut to create the diagonal line. The cut edges were coloured with Early Espresso to give more definition. The leaves were stamped before the top layer was raised on dimensionals so that the formation appears over two levels. I just adore the combination of Lost Lagoon, Blackberry Bliss and Crumb Cake and I'm happy with how this card turned out. 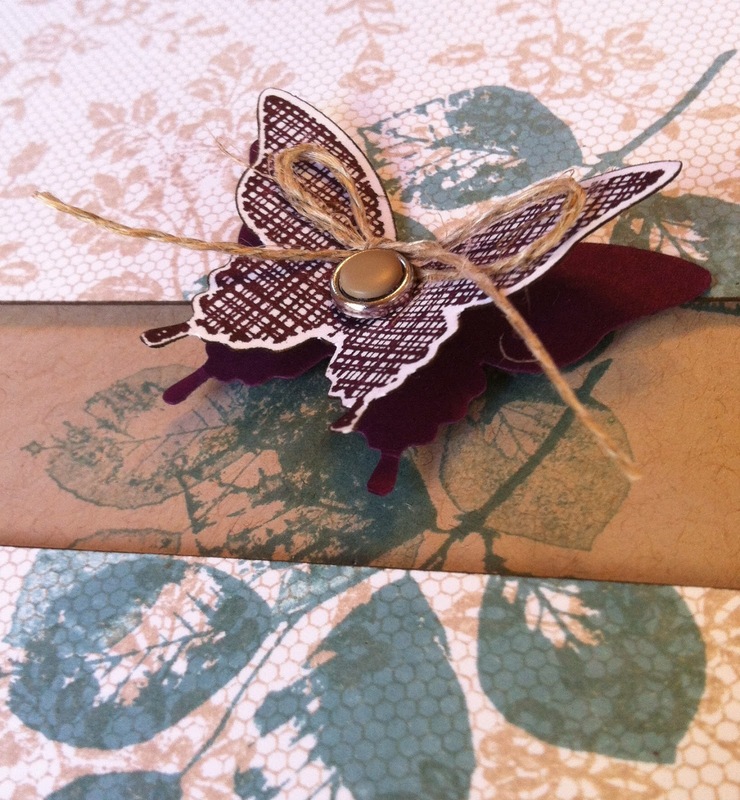 Other: Butterfly punch, Brad Base, Crumb Cake candy dot, linen twine, dimensionals, Early Espresso marker pen. After the summery weather of the last few days, today is feeling quite wintery so that makes it a good day to go to my craft room. Too hot, too cold, too windy, too rainy: all good reasons. 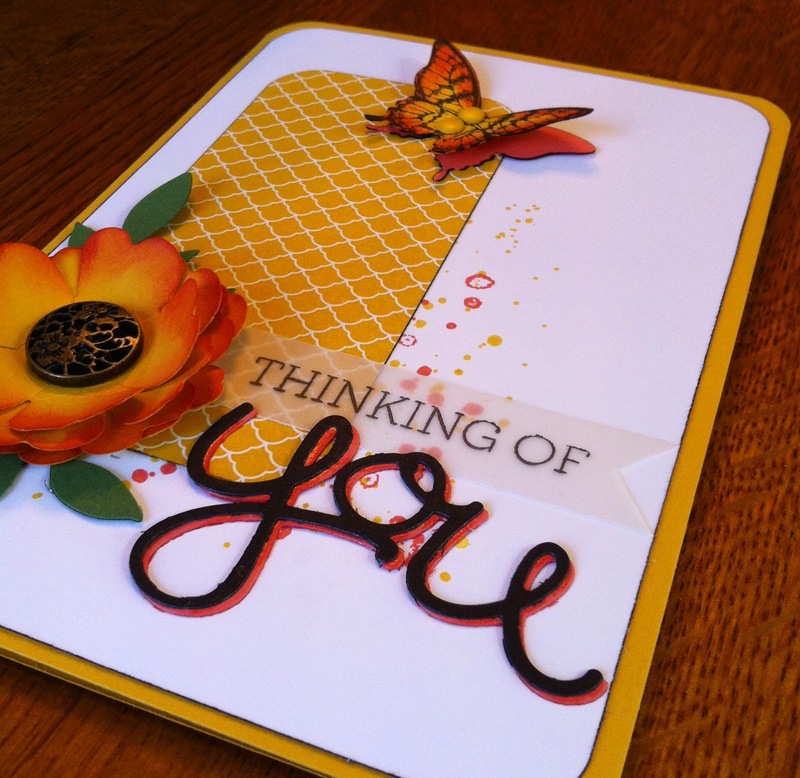 I wanted to enter the Paper Craft Crew Challenge but it's taken me a while to come up with an idea that I liked. The sketch was, as usual, both challenging and interesting. 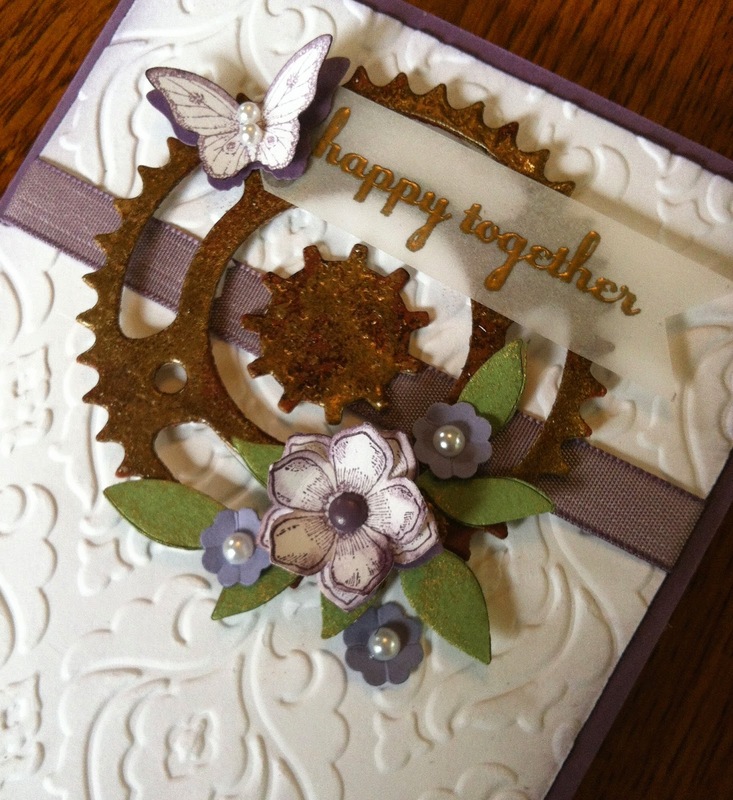 Everything in this card is Stampin' Up, except for the Spellbinders Sprightly Sprocket dies that I used to cut the cogs out of corrugated cardboard. Then I used a mixture of gold, cajun craze, gold embossing powder and clear embossing powder and lot of blending, heating, smearing and layering to get a faux metal effect. 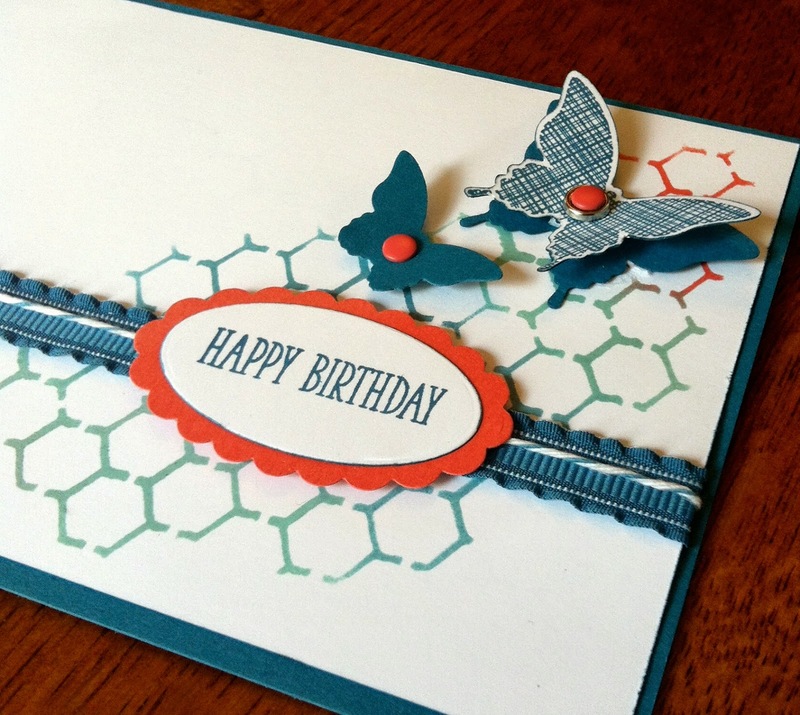 I learned of this idea from a Stampin' Up video clip by Allison Okamitsu. Not so clear in the photos is the gentle ink distressing in Perfect Plum around the edges of the Beautifully Baroque panel and the gold ink lightly daubed over the Wild Wasabi leaves. The big cog is raised from the panel by dimensionals and that, along with the eventual height of the flower, will send me back to my room to create a package style envelope for this wedding card! 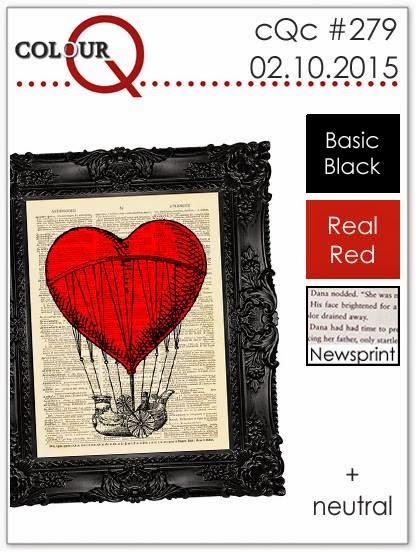 Yesterday, I got myself into a bit of a shabby chic mode after helping my daughter with her request for a "dark Valentine" card and then spotting a colour challenge at ColourQ that inspired me to move onto the dark side myself. 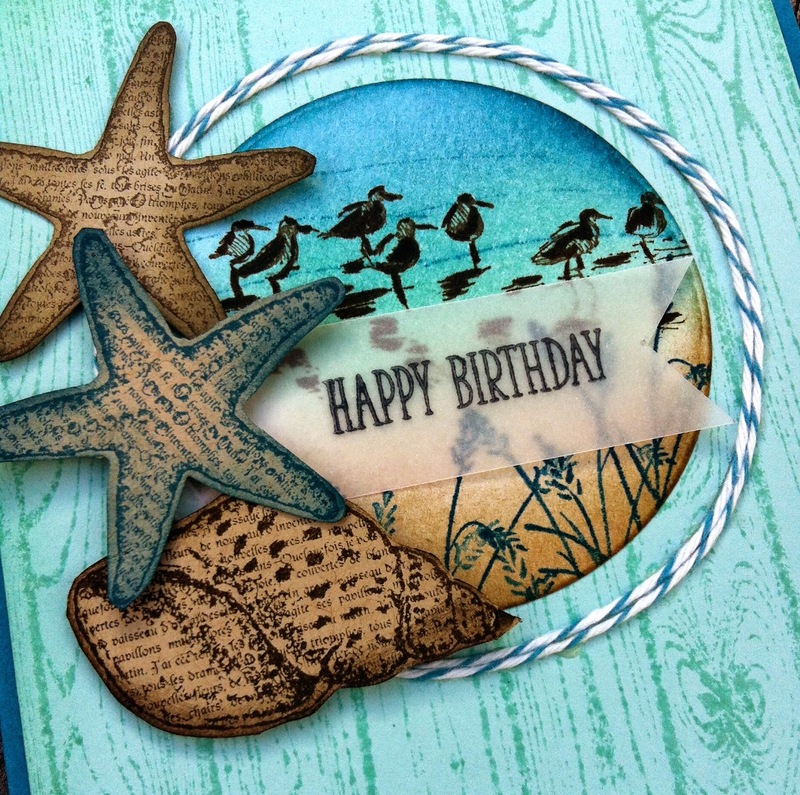 Seems that this shabby chic mode continues today in this challenge for Create with Connie and Mary. The lacy panel is black I Love Lace stamped onto Sahara Sand and gently distressed with black ink. The Sahara Sand leaves, cut with a now retired leaf sizzlit, have also been distressed. They were quite fiddly to do and in the end, I used a cotton bud to do it. They are not tightly glued down, only dotted in places, to give more sense of depth and movement. All other cut edges have been coloured a black stamp'n'write marker to give better definition and to tie the elements together more. The top three layers of the flower have been gently curled up and those layers have been popped up on dimensionals from the bottom Hello Honey layer to give more depth. The black and Hello Honey "thanks" have been slightly offset to create a shadow. 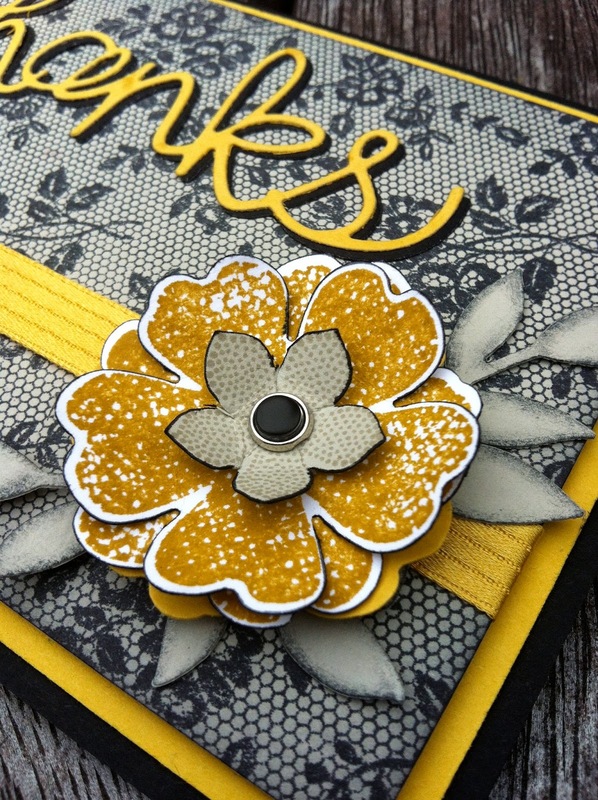 Card: Black, Hello Honey, Sahara Sand, white scraps for the two large flowers. Even Goths have birthdays and there's a special Goth lady in our family. She asked me to help her make a dark Valentine card for her other half recently and so when I saw this great colour challenge at ColourQ, I was inspired to try to make something she would like. 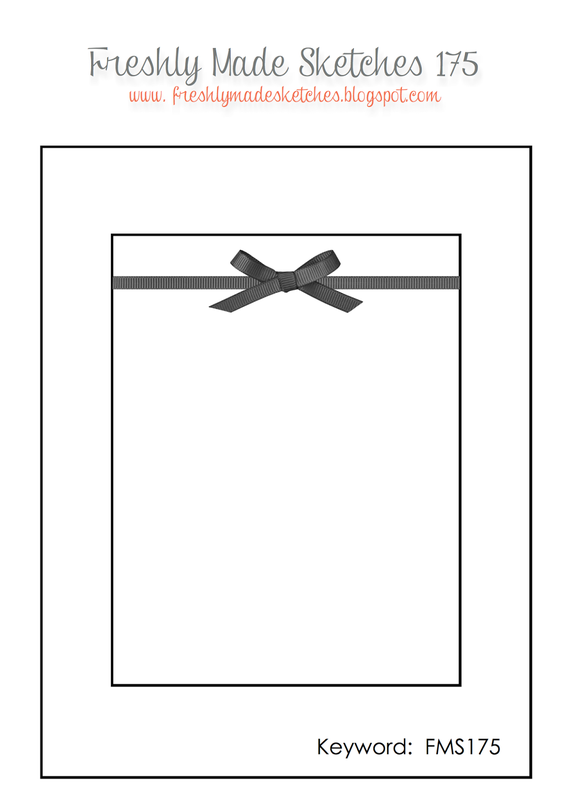 I rounded the corners of the card to echo the central circular panel. But most of all, I think this will appeal to my Goth girl. Stamps: SU Dictionary, SU Flowering Flourishes, SU Papillon Potpourri, Clearly Besotted Fabulous Fuchsia (sentiment). Ink: Black, Distress Ink Soot Noir and Barn Door, Versacolour Cardinal. Other: Circle framelits, Butterfly punch, Black rhinestones, Dimensionals to raise circle panel and butterfly, sponges, corner rounder punch. It was a great way to end a fabulous weekend! Other: Stitched rectangular die, circle framelit, butterfly punch, Coastal Cabana ribbon, linen twine, candy dot and brad base, dimensionals. The challenges at As You See It always look so interesting. I love the way the challenges are presented on the page: so enticing! I love these summery colours in the free paper from Sale-abration and they suited the weather here today. Coastal Cabana could well become my new favourite colour. 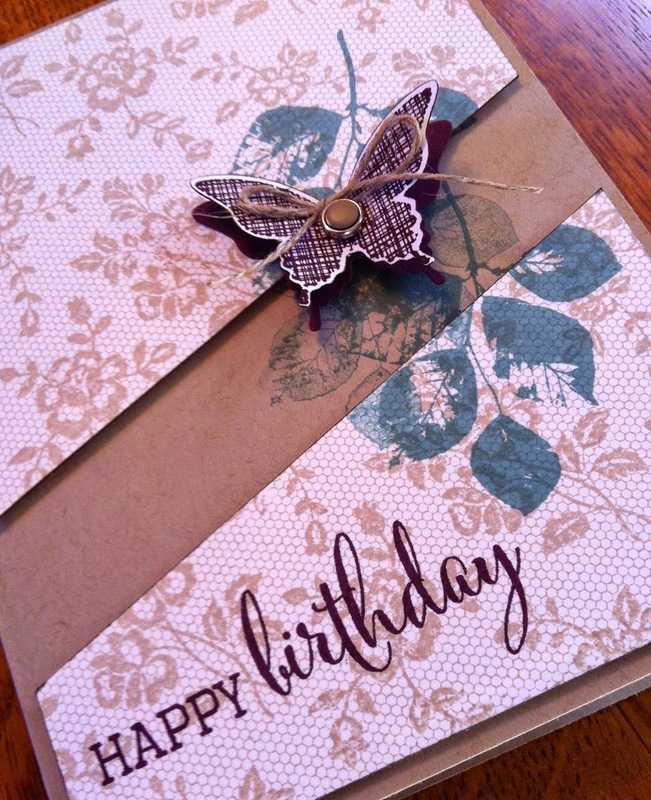 The card is a birthday card and the "Happy Birthday" is on the inside. 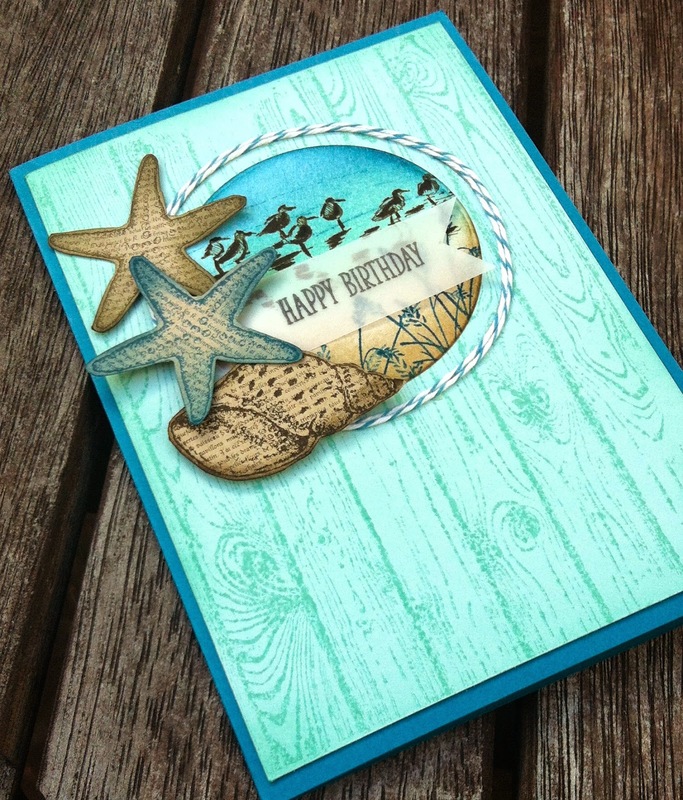 Card: Coastal Cabana, Whisper White, So Saffron, Best Day Ever DSP, vellum. 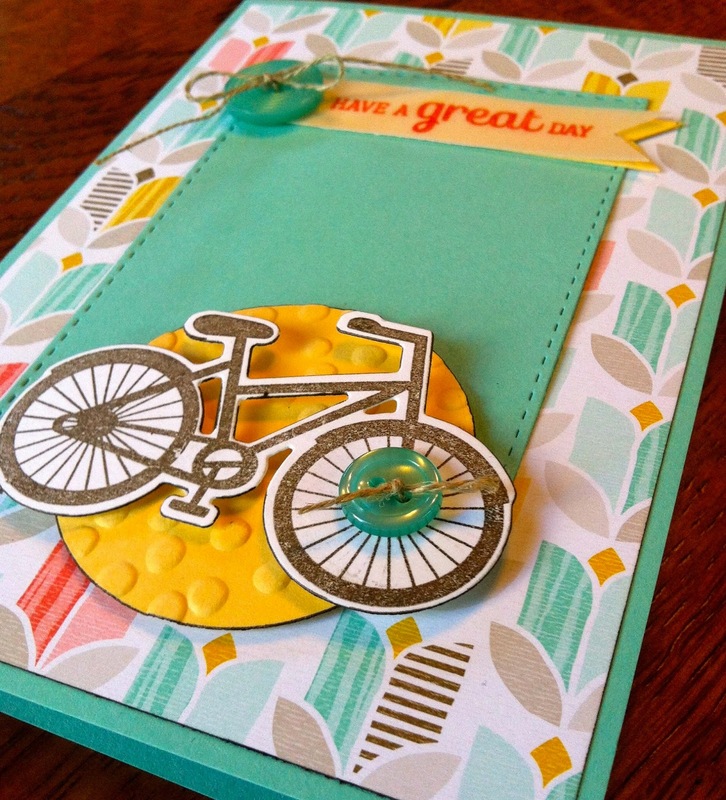 Other: Stitched rectangle die from Simon Says Stamp, Clearly Besotted Good Times die, Circle framelit, Early Espresso marker to colour cut edges, SU Decorative Dots embossing folder, Coastal Cabana buttons, Linen twine, Dimensionals to lift yellow circle and bicycle. This is the first Just Add Ink challenge I've played this year and it was an interesting one for me as I don't usually play around with hexagons. Quite a bit of thinking time went into what I might do for this game, before I remembered my TCW chicken wire mask. I felt much happier once I re-discovered that! 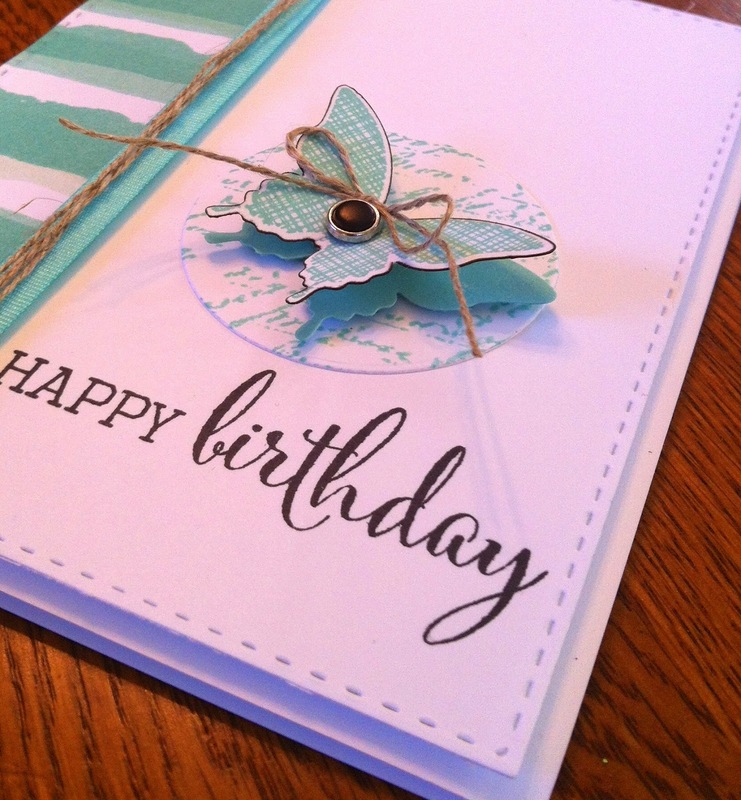 Other: Oval scallop punch, oval framelits, Island Indigo ruffled ribbon, Island Indigo baker's twine, dimensionals, Coral Calypso candy dots, brad base, butterfly punches, Island Indigo marker pen. daubers.